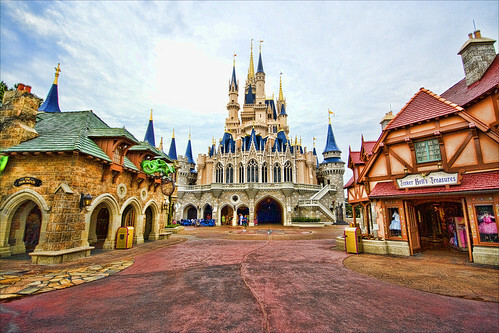 The long awaited renovation of the Magic Kingdom’s Fantasyland is to begin soon in the coming years. With lots of buzz about what new attractions the park will get, how the facades will look, and the changes made to existing attractions, clearly some people (like myself) were anxious to see plans for the “new” Fantasyland. One person was lucky enough to get his hands on what appeared to be detailed plans for the upcoming Fantasyland renovation and fortunately put them on the internet. 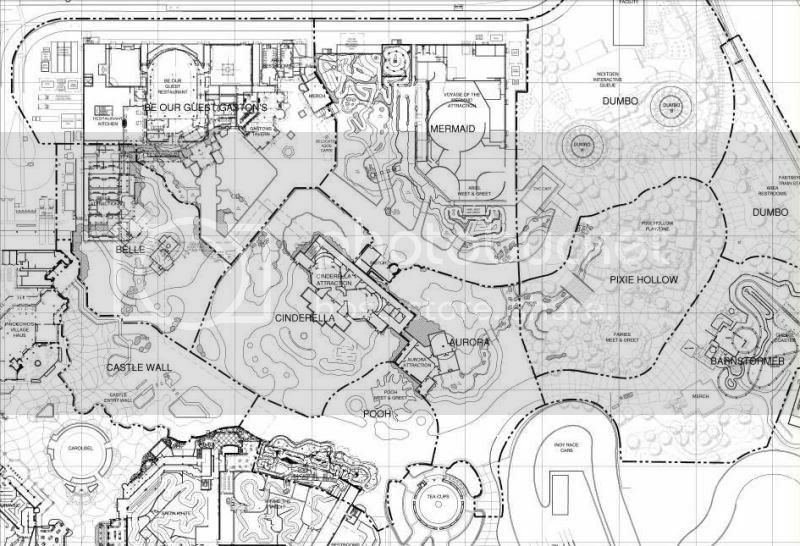 These plans call for the additions of a Cinderella attraction, two Beauty and the Beast themed restaurants, a Belle Meet and Greet, a Winnie the Pooh Meet and Greet, an Aurora (Sleeping Beauty) attraction, Voyage of the Little Mermaid dark ride, Aeirel Meet and Greet, the addition/movement of two Dumbo the Flying Elephant, and finally the addition of Pixie Hollow. The “Cinderella Attraction” seems to have the most room out of all of the new so-called attractions. While the shape of the building/queue is very odd because it is much longer in width then length, I do see the possibility of fitting in a small Snow White style dark ride in here however it would unfortunately have to be mostly zig zagging inless they come up with some sort of creative element. However it would be very cool if you got in your own carriage from the Fairy God Mother and followed Cinderella on her journey. Next, the “Aurora Attraction”, this looks more like a Meet and Greet. However all the Meet and Greets are labeled as Meet and Greets so I can’t believe that this is an “attraction” of some sort. In the plans, you can basically see it is just one room or so. I mean, perhaps it is an enlarged version of Disneyland’s Sleeping Beauty Walk Through, but it almost looks like a chamber guest walk in and then a great mass of effects come. I think that this would be very popular if done well and that leads me to believe that the Cinderella “attraction” will be similar because they are both one room shows as they appear in the concept art. Beauty and the Beast seems to be getting two different restaurants, one is a full service restaraunt approriately called “Be Our Guest.” Wouldn’t it be wonderful if in the middle of your dining a huge audio animatronic showing of the “Be Our Guest” scene straight out of the movie happened magically while you ate dinner. It sounds like a great restaurant as well as a nice hat tip to the past idea of making the Enchanted Tiki Room a restaurant. Also, there will be a quick service restaurant which is titled “Gaston’s Tavern”. Gaston’s Tavern looks fairly small so I wonder if there will be an abundance of seating outdoors or not. The grand daddy attraction to be added in this new Fantasyland is the Voyage of the Little Mermaid. Unfortunately/fortunately it will be a copy of the attraction going into Disney’s California Adventure. While the attraction is rumored to be extremely high quality and on the magnitude of the attractions at Tokyo Disney Resort, I really wish they opted out for something more unique. Again, imagine that you were seated into a grand chair and the chair moves through the halls of the castle before it starts talking to you and everything in the castle begins to talk. Don’t know where I am going with this? Just a magnificient chair ride through the story of Beauty and the Beast in an omnimover (Buzz Lightyear Astro/Lazer Blaster, Haunted Mansion) veichle. One of the most controversial additions these plans call for is two Dumbos. The current Dumbo would be moved and a second one added effectivly doubling the capacity of the ride, dubbed by enthusiast as the Dueling Dumbos! I think that with some new additions to each side, and a different design then the current one, it would look great. I have faith in Disney when it actually comes to designing a Dumbo. The really interesting part about Dumbo is the “NextGen Interactive Queue”. I really don’t have a clue on what this could be. Perhaps you are walking through the outside of the circus and shadows of clowns interact with guest? I am not really sure. There is also a second area labeled Dumbo besides the two flying carousels area. I am not sure what this is for. All of these would take over the old Submarine Lagoon as well as most of Toon Town Fair. Thank goodness that it is taking over Toon Town Fair because that place was hopeless in terms of theming if they weren’t going to make it a full fledged Toon Town (as what makes Toon Town so great is the downtown theming which lacks with the “fair”). Either way the only thing left of Toon Town Fair is Barn Stormer, a vekoma roller skater. It was rumored that a 7 Dwarfs Mine Coaster would come as part of the expansion but these plans don’t show it. Could Barn Stormer possibly be rethemed to the 7 Dwarfs, we would just have to wait and see. As you can see, in the coming years, we will hopefully see and announcement about the new Fantasyland with some in depth details and confirmed attractions. I can’t wait to see what else we will hear about these brand new additions in the coming weeks, months, and years. What ever happens, Park Thoughts will be there to cover the story! Thanks for reading. Images 1 from Plan-a-magical-vacation.com. Image 3 from Matt Pasant on Flickr.